Jumping off from that same point of view, someone else has gotten, at least, a small part of the problem figured out with an electrical twist. This innovative research was published last week in Nature Communications, a peer-reviewed scientific journal under the Nature Publishing Group. The new adhesive, nicknamed “Voltaglue”, opens up a host of possible practical applications, from making underwater repair works for ships and pipes, to being a versatile tool for doctors performing surgery. In future, surgeons could use biocompatible glue patches to join two pieces of internal body tissue together in one or two minutes, instead of sutures which often require 15 to 20 minutes of careful stitching. Assistant Professor Terry Steele, the lead scientist for this research project from NTU’s School of Materials Science and Engineering, said it took them over a year to develop an adhesive that could work under wet conditions such as in the human body or underwater. “Most glues in the market don’t work under wet conditions, much like how sticky tapes won’t work if the surface is wet, since the adhesive will stick to the water instead of the surface,” said the American scientist, who graduated from the University of Minnesota before he moved to NTU Singapore. Usually adhesives such as superglue harden upon contact with moisture in the air. Others like epoxy, often used in electronic mobile devices, has to be baked in high heat of about 150 degrees Celsius, or made using two different chemicals mixed together. These methods are unsuitable in wet environments. This unique electrocuring property allows Voltaglue to be customised for different applications. “For example, if we are gluing metal panels underwater, we want it hard enough to stick for a long time. However, for medical applications, we want the glue to be more rubber-like so it wouldn’t cause any damage to the surrounding soft tissues,” Asst Prof Steele explained. Voltaglue is developed using hydrogels consisting of carbon molecules called carbenes grafted onto tree-shaped plastic known as dendrimers. Upon contact with electricity, the reactive carbenes, which are capable of hooking onto any surface nearby, are released. The amount of “hooks” created depends on how long electricity is applied and how many carbenes are present. This technology is currently patented through NTUitive, the university’s commercialisation arm. Another distinct feature of the new glue is that it could be made reversible, said Asst Prof Steele. He is now furthering research in this area, aided by a competitive research grant of almost US$670,000 awarded by Singapore’s Ministry of Education won earlier this month. As the world becomes more concerned about sustainability, companies are looking to design ‘End-of-Life’ products that can be easily recycled, reused or remanufactured into new parts and components so as to reduce waste and energy consumption. Glues which can cure and be subsequently un-cured through electricity would be the industry’s “Holy Grail”, as automakers and shipyards will be able to assemble and dissemble parts with ease, minimising the need for fixation by bolts, nuts and screws. 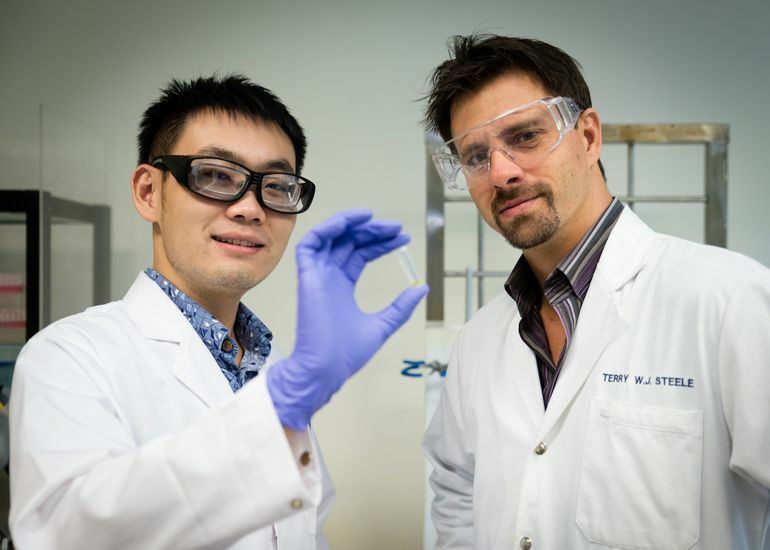 Moving forward, Asst Prof Steele and his team of 11 researchers are working to improve their new electrocuring glue so it can harden in just a few seconds, compared to about 30 seconds now; and also working on a way to undo the process. They will also look for the best way to commercialise the technology through a new start-up or via industry partnerships. The first part of this kooky, tongue in cheek journey involves the use of medical high-tech tomfoolery. I call this design the Stasis 7. The second part of our academic adventure involves a “boat” that actually has a quite a bit of potential in its design thinking and even if it engages a good bit of nuttiness in some of its appendage magnificence, it could still work effectively. I call that one, The Oceanic Pencil. These two articles were published some time ago on Duckworks and they drew quite a bit of reader response back then. 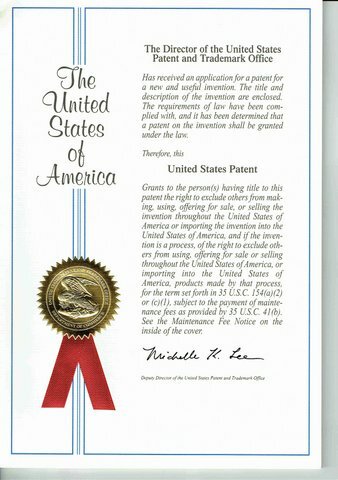 In this day and age, with advancements in medical capabilities, enhanced technology in all disciplines and a solid understanding of solar and wind electrical generation systems, these kinds of projects are just simmering, waiting for someone to come along who really wants to to push the boundaries and benefit from the data so discovered along the way. Please sit down, kick back and digest the goofy, the real, the possible ways for one to get oneself across a major body of water and do so in a couple of ways that nobody is currently considering. It must have been about a month ago when yet another round of size oriented boat talk came whistling through one of the Yahoo Groups. Only this time it wasn’t the typical penchant that boaters have for “Gotta Get Me a Bigger Boat” cause a bigger boat sends a real message to the other guys out there when they see me tied-up to the dock. Nope, this time it was all about how small can you get it and still cross an ocean. Personally, I find this process to be right out of the tales of Marquis deSade, as only a true masochist would fold himself into one of these ridiculous compartments and call it comfortable for anything more than a Photo Op. Dr. Phil couldn’t have suited-up a better guest for his show than this.Nevertheless, there it was, the announcement that someone was going to not only build one of these claustrophobia generators, but they were also going to do a booklet on the construction of same… and have the audacity to charge for said, copyrighted booklet. So there I sat in my studio, wondering just what went into the decision making process that would lure an apparently sane person into the interior of what amounts to a floating sleeping bag for a trans-oceanic thrash into some level of personal stardom. Hmmmmm, the mind can truly do some weird things when it gets onto a roll of such obscure strategies. OK, I’ll just admit it up front. The weirdness (some might call it macabre) of it all had me hooked and so I set off to design a pair of really small boats for tooling off into the sunrise after leaving the safety of Newfoundland. Great Britain, here I come, though not without my own philosophical baggage along with a whole host of ethical questions regarding ocean crossing behaviors. This is the first of the two designs. I believe that my design for the boat I call Stasis7 does that and more.While the current record for the smallest boat to sail across an ocean is held by the 5’4” Father’s Day sailed by Hugo Vihlen, I wasn’t really going for the record with my first design. Instead, I wanted scientific novelty and the undying adoration of the pharmaceutical and medical community. I also wanted to take the tiny boat community and functionally poke it in the eye…. repeatedly. The big issues aboard such a small boat are, naturally where to store the necessary food and water as well as how to keep the crew safe in nasty conditions. Stasis7 addresses those concerns with a novel set of solutions that virtually guarantee a healthy and rested crew upon arrival in Great Britain, though they may just be regarded as cadaverous by any normal measuring method. 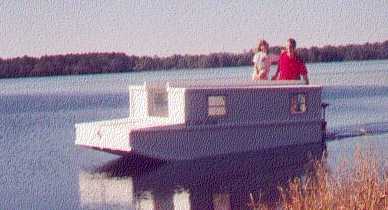 The boat is a mere 7’ in length overall with a beam of just 32”. Stasis sports a sail of just under 30 sq. ft. 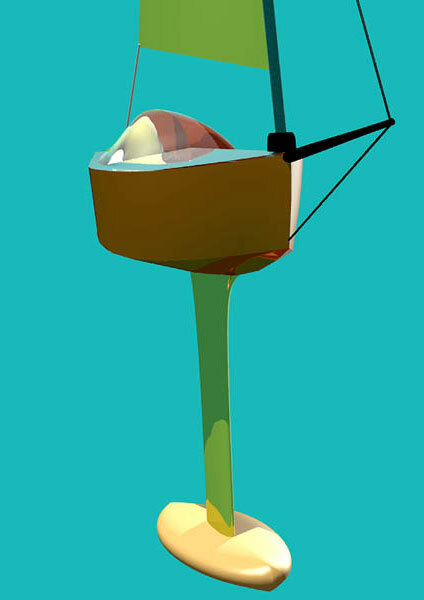 The sail mounts to an aft pivoting step right at the stem with a small bowsprit projecting forward from nearly the same position. The sail is fixed to the mast and the mast rotates to reef the sail. In a big blow the mast not only rotates to stow the sail but it lays flat on the deck. All sail controls are automated from a central microprocessor that takes input from wind speed and direction, barometric pressure, sea state differential potentiometers, G-force sensors and GPS. The sensor output is collected and fed through the processor where it is compared to hundreds of different sailing and sea state scenarios to predict conditions, as well as derive the proper settings of sail trim and deployed surface presented to the wind. In short, all sailing controls are automated for the occupant. At the core of the success of the boat is it’s fantastic ultimate stability which is derived from a long, hollow keel appendage that is terminated with a weighted bulb that is cast in one piece, guaranteeing that the bulb will not fall off, destabilizing the boat while under way. The long, fin appendage also houses all the necessary life support equipment for the journey, thus freeing-up the cabin space in the main hull for the crew’s comfort. Crew comfort in this case, is perhaps a misnomer of sorts, as it is not derived in the normal sense of the descriptive usually associated with boating activities. 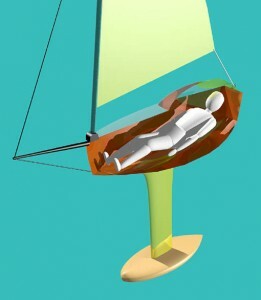 The solo crew of Stasis7 will cross the Atlantic in a drug-induced state of suspended animation. 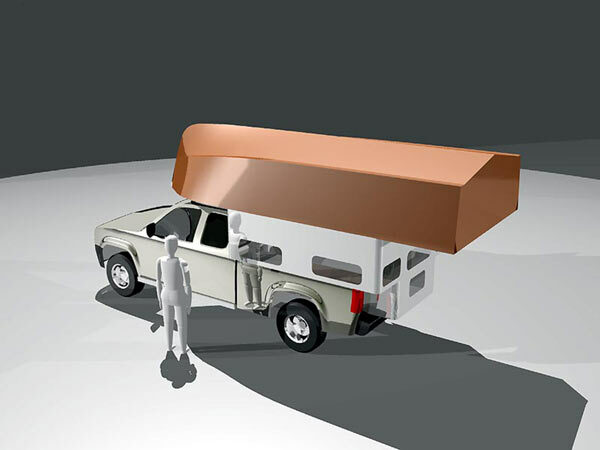 To truly free the occupant from most of the needs of the typical metabolizing human, they will be hooked-up to an I.V. drip for the entire journey. The IV solution will provide the minimum amounts of saline, sucrose and necessary salts to maintain proper metabolic conditions while under the influence of the proprietary Stasis7 cocktail that is included in the solution. The crew will wear a special suit that will recycle all fluid perspiration and return it to the filtering system where it will be made available for re-introduction to the IV process. The same will apply to all urine, as it will be collected via catheter for the same, recycling process. With metabolic rates reduced to less than 10% of the normal, resting condition, supplemental needs will be reduced to near zero beyond those provided in the IV. Mild brain stimulation will be provided through a special skullcap that will massage the electric capacity of the brain to keep the synapses firing at a very low ebb. 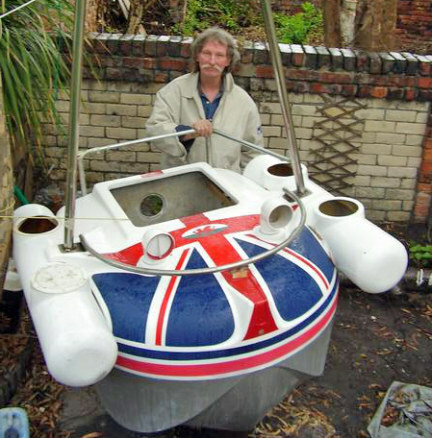 This will ensure that the crew can come back out of the Stasis process as the craft nears the shores of England. Since this boat is designed to take a small advantage from the prevailing winds during the journey, it is primarily a drifting vehicle that will enjoy the gifts of the Gulf Stream for most of the trip. It’s a simple boat, really. A comfortably padded interior with soft, NASA memory foam throughout. A smart glass, Lexan, canopy that darkens in bright light and returns to a nearly clear state in the night, will regulate lighting. So, there it is; the no-brainer method to cross an ocean in the smallest of boats with minimal hassle for the occupant. At thirty miles off the English Coast, the GPS triggers an automatic injection into the IV solution of a pleasant chemical cocktail that brings the crew back to a normal state. This process allows them to steer the Stasis7 into the nearest harbor for a pre-placed meal, designed to jump-start their GI tract without any rude surprises. I figure 2 months and some change to get across the Atlantic. In Part One of this exercise in smallness, I presented the concept of “going under” for the slow ride across the pond to England. In Part Two I will actually address a conceptually feasible approach to the technical question of how short can a boat be and still satisfy the needs of a conscious sailor who wishes to cross the Atlantic ocean. I was looking hard at the various tiny boats that have crossed the Atlantic over the years and they seem to have gotten smaller to the point of the absurd. 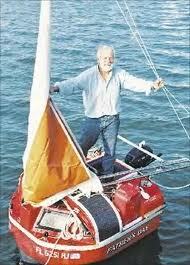 I previously mentioned Hugo Vihlen’s record setting boat, Father’s Day at 5’4” from 1993. It was pretty obvious to me that his boat had been measured to 5’4” in order to just whisker under the boat length of his ultra-micro crossing rival, Tom MacNally who had just performed the same feat in his boat, Vera Hugh, that was 5’4.5”, also in 1993. 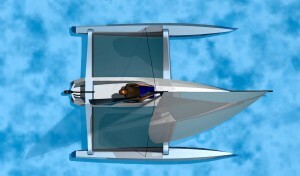 MacNally rallied his forces to produce an even shorter boat in 1998, the Vera Hugh II that measured an astoundingly short 3’11” for a go at the record. Apparently that boat did make the journey from Portugal to the Canaries, but for some reason, has not actually been put in the water for the big jump across the Atlantic to the Caribbean. As far as I know, she still sits in storage in the Canaries, waiting for her suitor to ride her to victory. That means the door is wide open for a memorable, record setting design to splash down off Labrador and be swept to the enchanting Isles of Great Britain in the loving arms of the Gulf Stream. 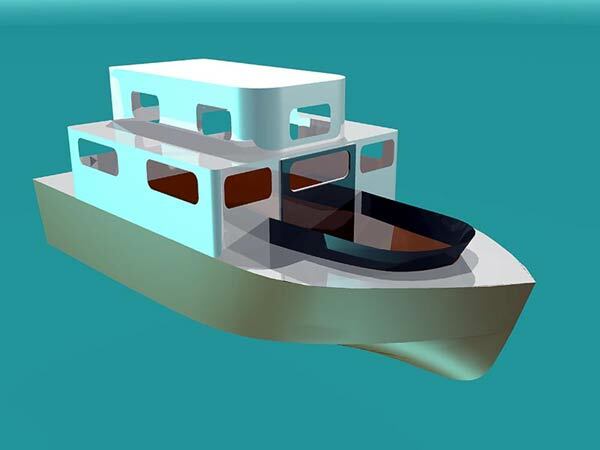 Coincidentally, I have just the design to do both tasks, though it does require a bit of creative interpretation of the apparent rules in order to truly get a boat down to those sizes for this trip. 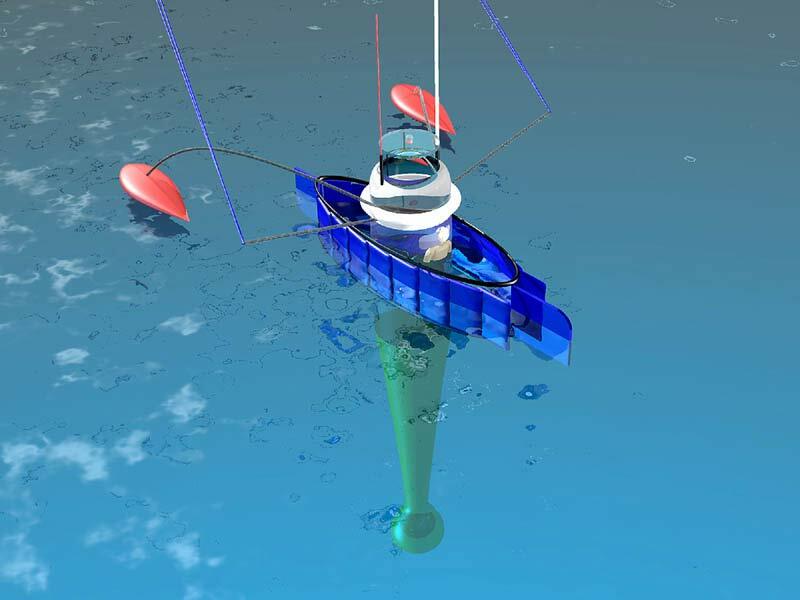 When you look at the Vera Hugh II in photos, what you see is essentially a floating, untethered buoy that has a very small sail area to augment its drifting posture at sea. The boat is festooned with bolted or welded-on apparatus to further enhance the capabilities while leaving the essential hull length undisturbed. Apparently, this festooning includes the rudder and the support tubing to hold it aft and stable. If the loose interpretation allows for such a craft to be measured by the contained vessel volume alone, then I’m in there with my new design. 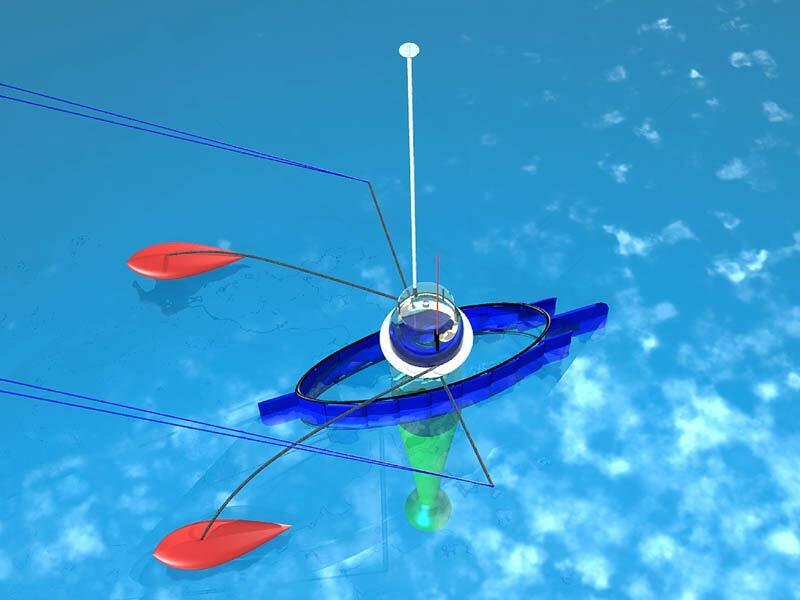 I present the Oceanic Pencil, a craft made for the purpose of long distance, ocean crossing sailing/drifting/kiting while performing valuable scientific studies of the currents, flora and fauna, salinity issues and water temps along the way. The Pencil’s in-the-water length, is 5’ exactly. That was easy to arrive at because the “boat” is pretty much just a cylinder that has been put up on its end. I can easily take the title of smallest boat at 5’ and only the Vera Hugh II, sitting in dry dock has any chance of breaking the record that the Oceanic Pencil will hold. The fact that I will liberally decorate the Pencil’s topsides with all manner of geometrically welded aluminum tubing is well within accepted norms for boats of this type. 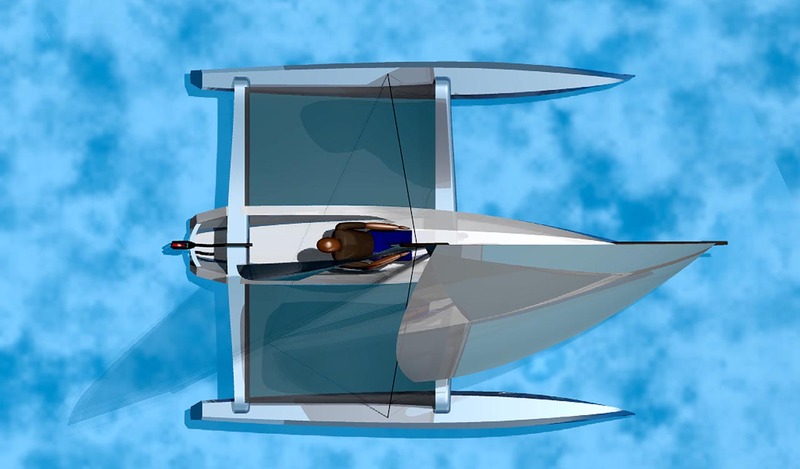 The cylinder is kept in the up and down position by means of a suspended bulb keel. 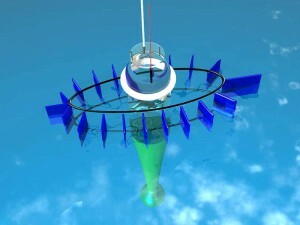 Actually, the cylinder tapers over its lower half until it reaches the bulb some ten feet below the living quarters area. I have designed the bulb to be filled with depleted uranium bullets and recovered shrapnel from the Iraqi conflict. The uranium’s radioactivity is shielded from the Pencil’s occupant with a liberal casing of pure lead. So, the problem of ballast is solved, and the world is better for it. A lot of additional life support systems are also stored as low as possible in the keel appendage and also the bulb such as heavy stores and batteries for the on-board electronics systems. Working our way up the keel cone, the Pencil maintains a series of low profile, rack mount computers for all the scientific functions that will be performed en route. The upper reaches of the cone provide space internally for ladder-climbing exercise routines for the crew to keep them fit. Unlike the Stasis 7, I don’t want my Pencil sailor to slowly turn to atrophied jelly while he crosses the open sea. 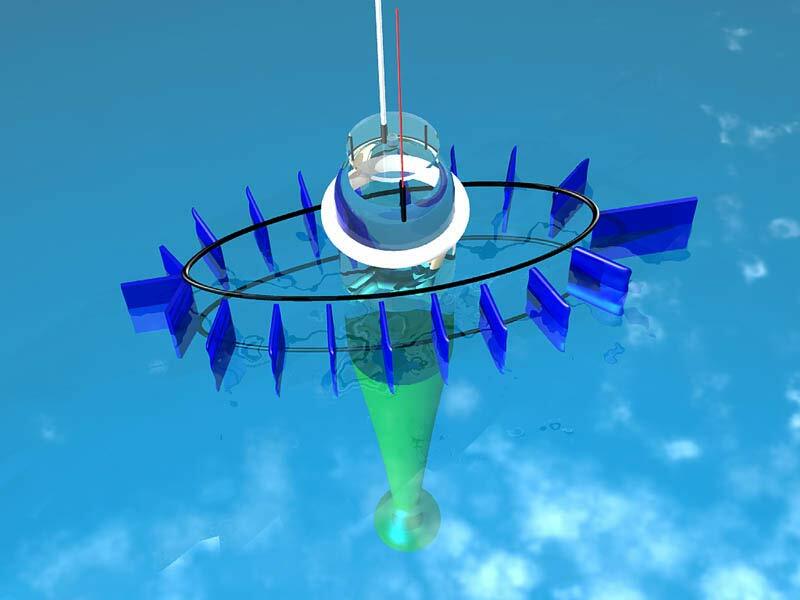 In the upper, cylindrical environment of the Pencil, the space has been given over to the comforts of the sailor with retractable video screens to monitor all the science functions as well as accurately chart the movement of the boat through the sea. This includes depth sounders, sonar, radar, military accurate GPS, several direct communications systems as well as full Internet connections in the Gigabyte speed region and on-board entertainment capabilities to pass the time when not engaged with his science duties. 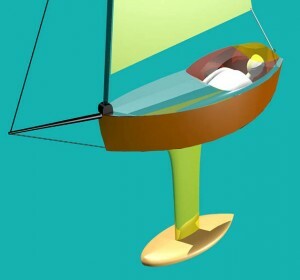 Sleeping on board the Pencil is done through a suspended hammock device that can be adjusted through several control points. This gives maximum comfort at the same time allowing the crew to infinitely adjust the attitude of the hammock for best resting position. 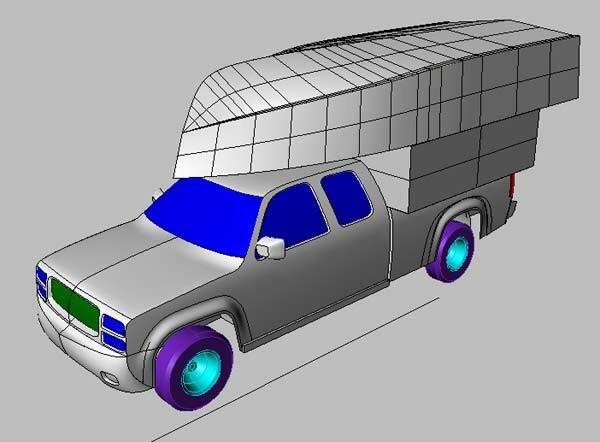 The upper four feet of the cylinder is actually composed of heavy gauge Lexan to give a full 360 degree view out to the surface interface so that the crew may observe sea life directly during daylight and also at night augmented with the use of waterproof high intensity lighting. The cap of the cylinder is capable of being flipped open during calm conditions, but can be securely dogged-down for the periods of time when the boat is being subjected to dramatic sea state conditions. 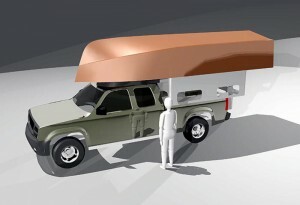 Antennas for most of the communication systems and GPS are mounted to the roof of the flip open hatch. 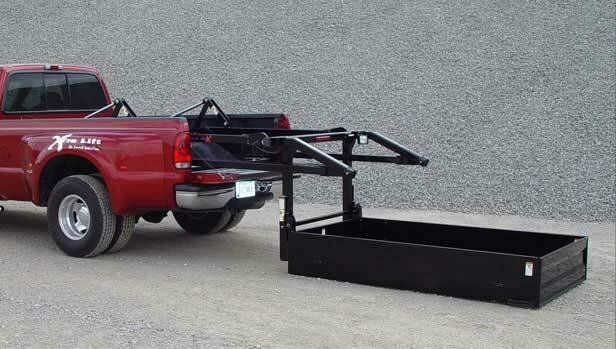 Some are mounted to the ring around the hatch so that they remain in their optimal, vertical orientation for continuous communication while the hatch is open. Perhaps the most interesting survival feature for these wild conditions is the fact that the boat can be re-positioned vertically in the water column. In short, the crew can take-on additional water ballast and literally sink the Oceanic Pencil to a controlled depth that takes away virtually all of the surface disturbances from the motion of the boat. When the storm has passed, the boat blows the ballast tanks with compressed air and returns to the surface. Propulsion to augment the current drift is obtained from a water launchable kite. Naturally, with the kite deployed and providing a 4-5 knot boost to the speed of the prevailing current, the boat will heel in the direction of the kite. To counteract that tendency, the Pencil will deploy a pair of inflatable amas. 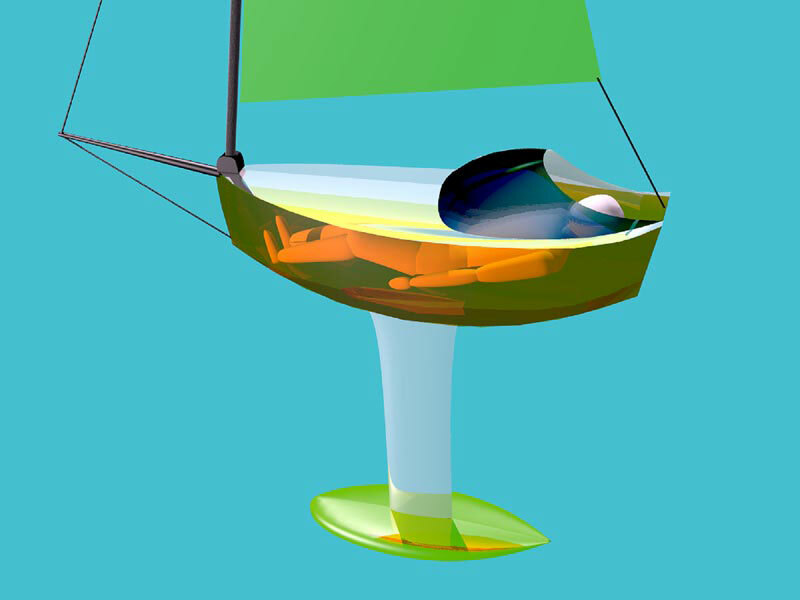 The amas are shaped like the bulbed keel of a racing yacht to maximize their flow through the water. The Pencil then takes on the wild looking form of a waterborne insect of sorts. To further enhance the movement of the Oceanic Pencil through the sea an ingenious array of baffle plates are spaced around the cylinder mounted to an elongated oval aluminum tubular frame that is suspended from the upper, above water, reaches of the cylinder. The baffles are controllable for how they are arrayed. When the baffles are radially oriented around the oval, they reduce the roll of the pencil enormously. When the kite is deployed, the baffles are then moved to fold neatly over one another in the suggested shape of a boat when seen from above. This shape improves the flow of the water around the Pencil hull and at the very narrow end of the elongated oval, the baffles there act as a rudder. If my description is lacking, please refer to the illustrations for better understanding. 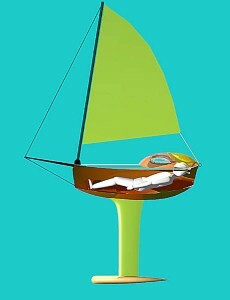 The crew has the option to erect a simple set of tubes in pre-positioned sockets so that they may suspend a hammock above the deck of the Pencil in nice weather. I envision long stretches of time in which the weather and seas will be very calm. During those times, the crew can climb out of the Pencil cylinder and virtually live above deck in fresh air and sunlight. He should arrive in England reasonably rested, tanned and fit. This is in stark contrast to the gaunt, near dead apparition that will emerge from the Stasis7 boat from Part One. I anticipate that a boat of this type, with virtually continuous communication and uplink/downlink capacity, would provide the ideal, long-term research vessel for advanced studies of the sea. This boat should be sponsored by a corporation in the business of communications who wish to be viewed as being at the forefront of technological discovery. With the high visibility footprint of a daily live broadcast to the Internet, this boat could be a floating example of how business can do things to truly benefit mankind as well as inspire young people who are just about to choose science as their filed of study. I’m thinking someone like T-Mobile would be ideal. Bridge the communication distance between Europe and the United States. Meld ideas and technology into a push to better understand the forces of our planet. 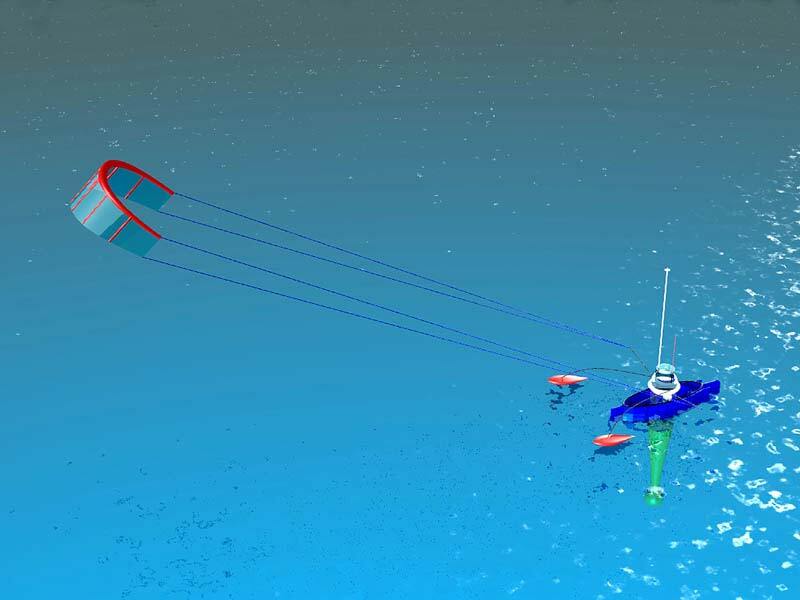 Make the Oceanic Pencil the undisputed record holder for the shortest boat to cross a major ocean.